Dardanus was a founding king of Greek mythology, a king of Arcadia before the Great Flood, and the man who would subsequently settle in the Troad (the Biga peninsula). The main flood myth in Greek mythology has Deucalion and Pyrrha as the only survivors of the Deluge, and the couple who would bring forth the race of man when they threw stones over their shoulders. Other stories though also exist which tell of other survivors, including Dardanus, and so to reconcile the myths, Deucalion and Pyrrha were then associated with mainland Greece, whilst other individuals were linked with other regions of the Ancient World. The Deluge, or Great Flood, was sent by Zeus to rid the earth of the impious and quarrelsome generation of man that now inhabited it. At the time Dardanus, alongside his elder brother Iasion, were kings of Arcadia. Dardanus and Iasion were sons of Zeus and the Pleiad Electra, thus grandsons of the Titan Atlas, the first king of Arcadia in some mythological tales. Some ancient writers would also state that Harmonia was a sister of Dardanus. Dardanus would marry Chryse, the daughter of Pallas, and grand-daughter of King Lycaon. Some say that Chryse brought with her the famous Palladium as part of her dowry, although this is just one version of the myth. Dardanus and Chryse would have two sons, Idaeus and Deimas. When the Great Flood came, the surviving Arcadians retreated to the mountains, and Dardanus and Iasion decided to build a boat and set sail upon the flood waters. Whilst Idaeus decided to go with his father, Deimas remained behind, and would become king of those who stayed. There is no mention of Chryse, and the supposition is that by this time she had died. The boat, with Dardanus and his followers on would set sail. The boat would first come to rest upon the island of Samothrace, and island that at one time, according to Pausanias, was known as Dardania. The stay at Samothrace was not a happy one though, for Dardanus considered the land of poor quality, and it was also on Samothrace that Dardanus lost his brother Iasion. Some stories tell that Dardanus and Iasion were invited to the wedding of Cadmus and Harmonia (although the timeline of events does get confusing at this point). During the wedding feast, the goddess Demeter took a fancy to Iasion, and whisked him away to have her wicked way with him. When the pair returned to the feast, Zeus instantly knew what had gone on between the pair, and in an act of jealousy, killed Iasion with a thunderbolt. Dardanus and Idaeus would leave Samothrace and arrived in Asia Minor near to the city of Abydos. The newcomers were welcomed to the land by King Teucer, and so enamoured with Dardanus was Teucer that he gave his daughter Batea in marriage. Teucer would then give to Dardanus land from his kingdom. At the foot of the Idaean Mountains (Mount Ida), named for Idaeus, Dardanus would build a new settlement, a city named for himself. The new settlement prospered, and Dardanus set about expanding his territory waging war against his neighbours, and creating a wider area known as Dardania. Dardanus and Batea would become parents to a number of children; a son Ilus, who died young, a daughter Idaea, who would become a wife of Phineus, another son Zacynthus, who was the first to settle upon the island of Zacynthos, and a heir to Dardanus, Erichthonius. 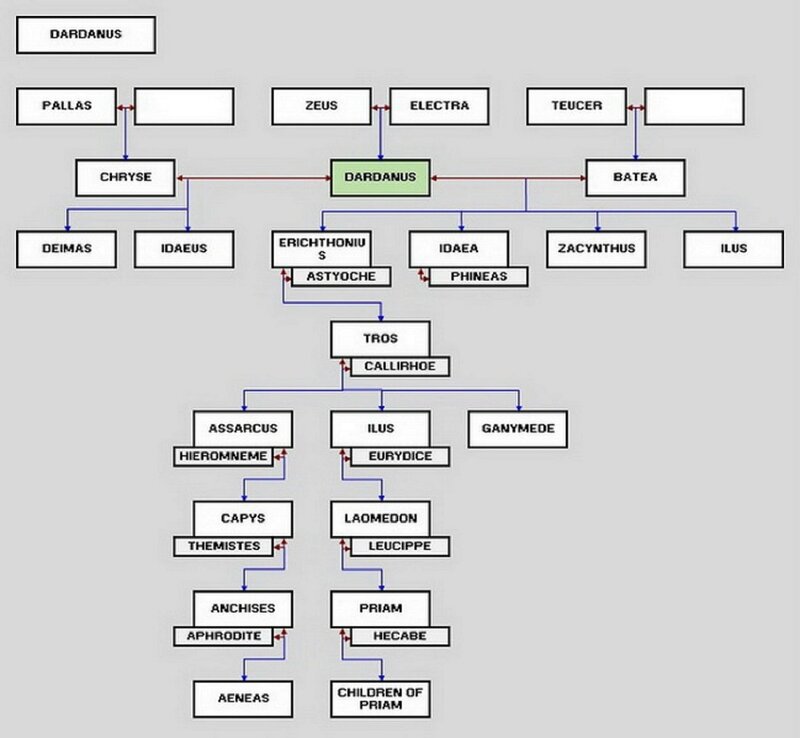 Via Erichthonius, Dardanus would become ancestor to many of the most famous individuals of the Troad, including Tros, Ganymede, Laomadon and Priam. The name of Dardanus lives on today for the Dardenelles are named after the mythological king. The narrow straits separating Asia and Europe were once known as Hellespont, a name which is also linked to Greek mythology, for Helle fell whilst riding the Golden Ram to Colchis.